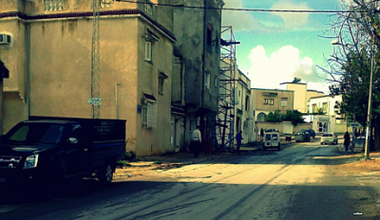 Three years after the revolution, Tunisia is searching for a new urban identity. 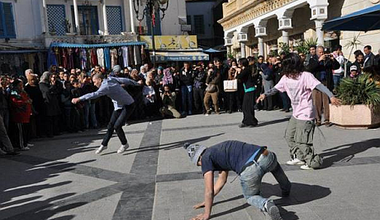 Two years after the revolution, Tunisians have reclaimed public spaces in the city. But failing municipalities, a lack of law enforcement, and scant engagement with urban planners are a cause for concern. After long heated debates, a final draft of Tunisia’s new constitution was released last week by the National Constituent Assembly. Hundreds joined the young man’s funeral procession in Jendouba and protested against the region’s poverty and economic marginalization. The announcement of the long awaited new government in Tunisia coincided with International Women‘s Day. Ironically, only 3 women were appointed in the new cabinet. The exclusion of women from key posts in the government is not a new phenomenon in the history of modern Tunisia. The ministry's website was also temporarily hacked and a call went out on social media for the staging of a "mega Harlem Shake" in front of the ministry on Friday. What’s next for Tunisia? Can democracy be saved? Following the assassination, Prime Minister Hamadi Jebali announced that Tunisia is to form a non-partisan government of technocrats to run the country until elections can be held. Denial runs through Tunisia: you say we absorbed the shock? Today, the one thing that devastated me the most is how quickly the president who is supposed to be a human rights defender, not just any president, stepped in to persuade us to get used to the spilling of blood. Tunisia is well known for its moderate interpretation of Islam. However during the last couple of years, a more conservative interpretation of Islam, or Salafism, has spread widely throughout Tunisian society. The political players (the ones in government and the opposition) should accelerate their efforts today towards reaching consensus and putting Tunisia above everything else. Weariness with unfulfilled promises, deteriorating economic conditions and the rising threat of violence was rather visible on the day celebrating the second anniversary of the Tunisian revolution. For many opposition parties the government is not doing enough to protect the country from extremism. One may indeed speak of an orderly, leaderless transfer of power in January 2011 specifically because constitutionalism was strong and alive. The first general strike in Tunisia since 1978 takes place in a much-changed country and against old friends but for rather similar reasons. A general strike will take place on Thursday, December 13, across Tunisia, a rare call, actually the third to be made by the powerful UGTT since its foundation in 1946. At the end of the day, most of the political sphere disagreements are not of any importance to the ordinary Tunisian and they ought to be resolved away from the public sphere. For the fourth day in a row, thousands of people are still protesting in Siliana demanding that the local governor quits. Bouazizi’s desperate act of self-immolation in response to his humiliation seems to be replicated once again under the rule of a legitimate government that came to power through the ballot box.